Presidential daughter and leader of the newly-formed political party Hugpong ng Pagbabago, Davao City Mayor Sara Duterte burned down Senator Risa Hontiveros for urging the head of the Public Attorney's Office (PAO) to resign from her post amid a spike in measles cases. Sen. Risa Hontiveros made headlines in the mainstream media after she called for the resignation of Atty. Persida Ruedas-Acosta in connection with the huge spike in measles cases in the country accusing the lawyer of fearmongering due to the Dengvaxia vaccine issue. The statement of Sen. Risa Hontiveros against the head of PAO caught the attention of Davao City Mayor Sara Duterte who responded and burned down the lawmaker on social media. According to Mayor Sara Duterte, the one who should resign is not Atty. 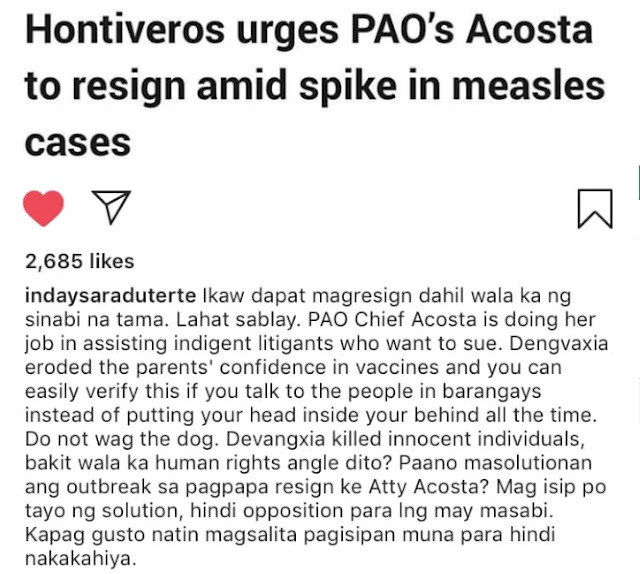 Acosta but Sen. Risa Hontiveros because she did nothing but wrong and malicious. The Davao City Mayor defended Atty. Persida Acosta who is doing her job in assisting indigent litigants who want to sue. because Dengvaxia eroded the parents' confidence in vaccines and Hontiveros can easily verify this if she just talks to the people in barangays. Mayor Sara Duterte also slams Hontiveros by saying that the senator should investigate instead of putting her head inside her behind all the time. "Ikaw dapat magresign dahil wala ka ng sinabi na tama. Lahat sablay. PAO Chief Acosta is doing her job in assisting indigent litigants who want to sue. Dengvaxia eroded the parents' confidence in vaccines and you can easily verify this if you talk to the people in barangays instead of putting your head inside your behind all the time." "Do not wag the dog. Dengvaxia killed innocent individuals, baka wala ka humang rights angle dito? Paano masolutionan ang outbreak sa pagpapa resign ke Atty. Acosta. Mag isip potayo ng solution, hindi opposition para lang may masabi. Kapag gusto natin magsalita pagisipan muna para hindi nakakahiya."